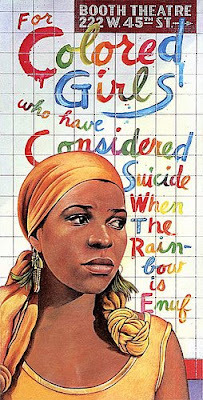 Finally, the folks in Hollywood have discovered one of my all time favorite plays/books "For Colored Girls Who Have Considered Suicide When the Rainbow is Enuf" by Ntozake Shange. A few days ago, was announced that music video director, Nzinga Stewart, is set to adapt the play as well as direct the film. Lionsgate will produce. No word yet on casting - although I get the feeling there are plenty of "colored" actresses out there just chomping at the bit for a role. This book, which is pretty much a series of poems about the constant struggles of black women in a not so black women friendly world, is what inspired me to write. I can't say enough good things about it and I'm totally stoked that it's being brought to the forefront. You should definitely check it out if you're not familiar.